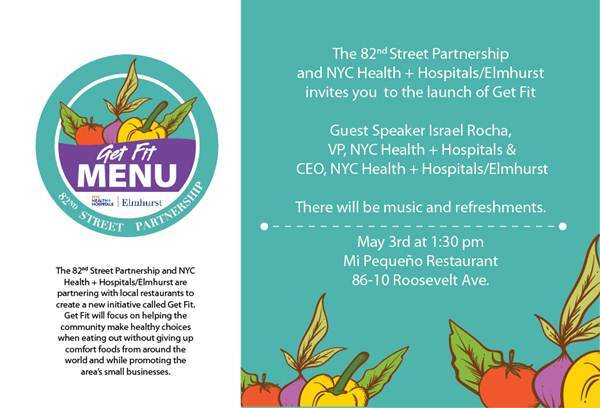 Join us, along with NYC Health + Hospitals/Elmhurst and guest speaker Israel Rocha for a celebration of the launch of Get Fit in Jackson Heights and Elmhurst. This program is a partnership between the 82nd Street Partnership, Elmhurst Hospital and our local restaurants, highlighting healthy choices on their menus. The initiative is focused on helping our community make healthy choices without giving up comfort foods from around the world, while also promoting the area’s small businesses and restaurants.